We were late getting off the mountain, delayed by the tire experience, and by the time we got back to Gonder, only had like an hour and a half to see what we wanted to see. Gonder. 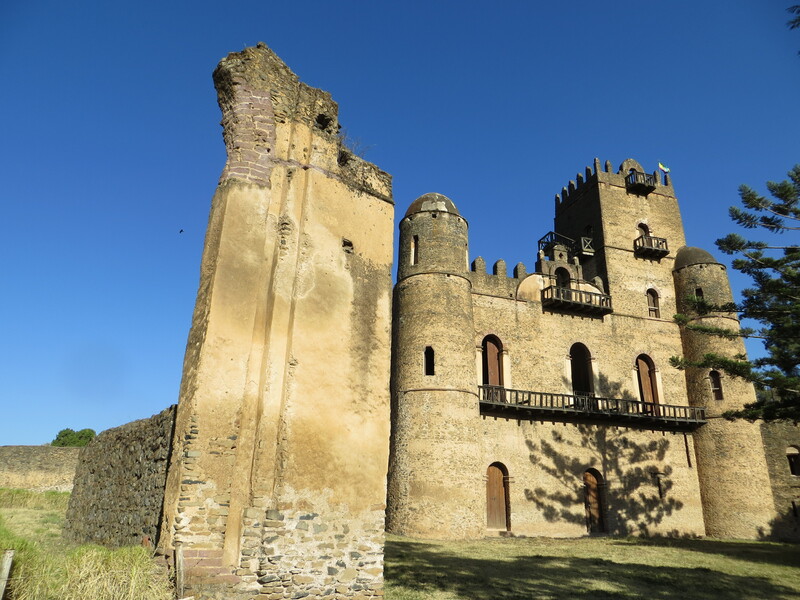 Gonder is a city of around 400,000 people. Like the other cities, it had that odd mix of unending, partially finished new construction, and goats in the street; the blend of old and new. We didn’t get a really good feel for it and it didn’t leave much of an impression on me, just because we were so rushed for time. But we at least hit some of the highlights. One of the palaces inside the Royal Enclosure, a 70,000 square meter compound with a number of palaces and castles dating back to the 1600s. Fasilada’s Bath – 100,000 people descend here for the celebration of Timket, on January 17th. Priests line the edges of the pool, spectators fill the bleachers, and many people jump in. They were filling it up when we were there in preparation. That evening was New Year’s Eve. We had some dinner in a place that apparently every other traveler in the city had read about, and saw some pretty wild Eskesta dancing – this is the traditional dance of Northern Ethiopia. My pictures were dark and didn’t do it much justice anyway…these women shook their shoulders and spun their head like, well, like they were possessed or something. Check this out to get an idea. In any case, we were in bed by 10:30. Oops. Bright and early the next morning (another theme…we had a LOT of early mornings) we were up and out for our three hour drive to Bahir Dar. 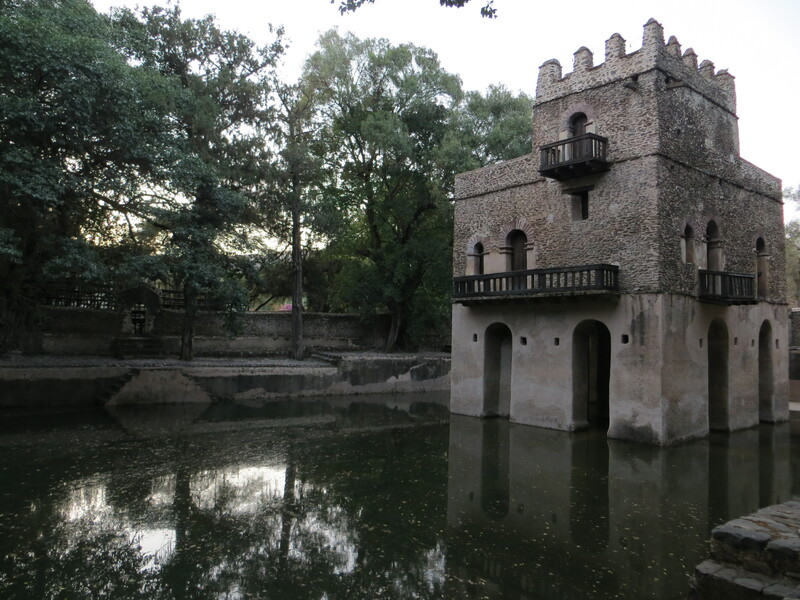 Bahir Dar. This was like a little slice of heaven. 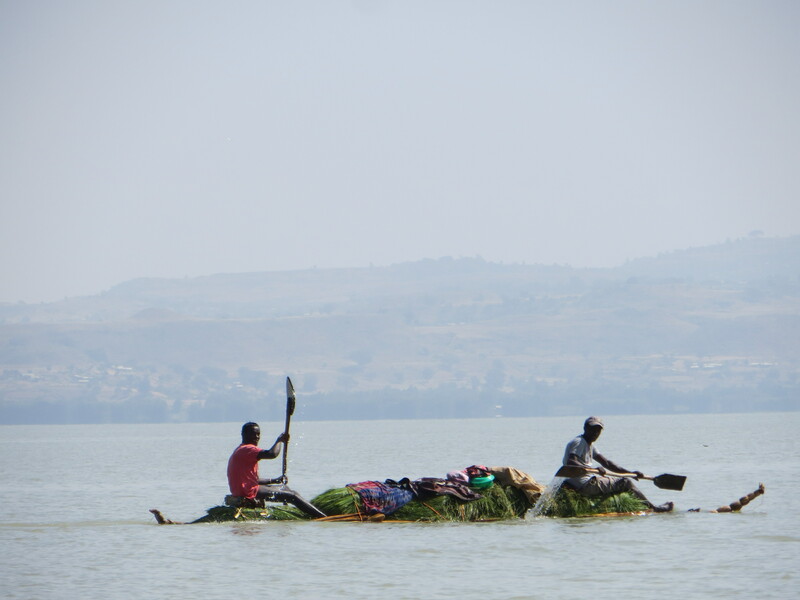 Much more plush because it sits right on Ethiopia’s biggest lake, Lake Tana, 3500 square kilometers and the source of the Blue Nile (and sporting by FAR the nicest place we stayed the whole time), it was a perfect way to wrap up the trip. I was always trying to pull the nonchalant picture thing, but it was difficult at our speed (cough, cough) and with the reflection on the window. Nonetheless, just to give you an idea, it was typical to see something like this. Pardon the bad, through-the-window shot. 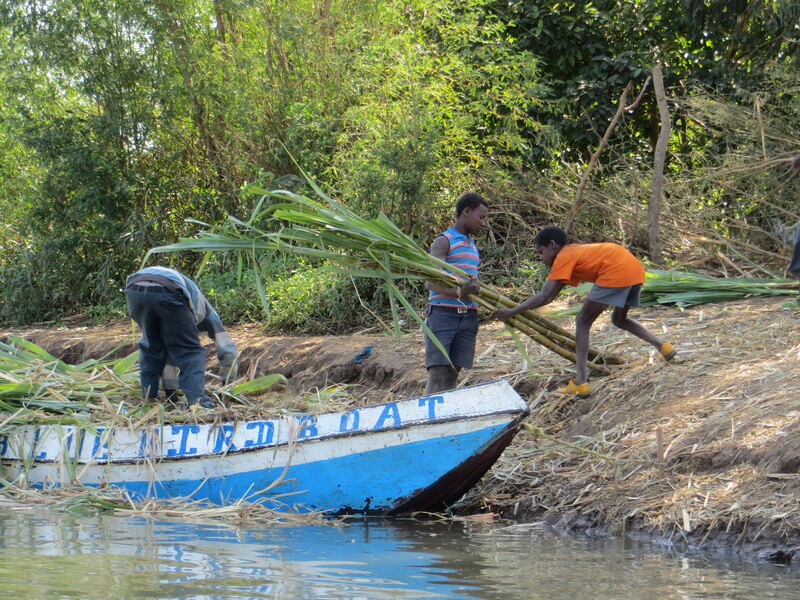 A typical boat, not for fishing but for transporting grasses, sugar cane, etc, that we saw on our ride out to the lake monasteries. 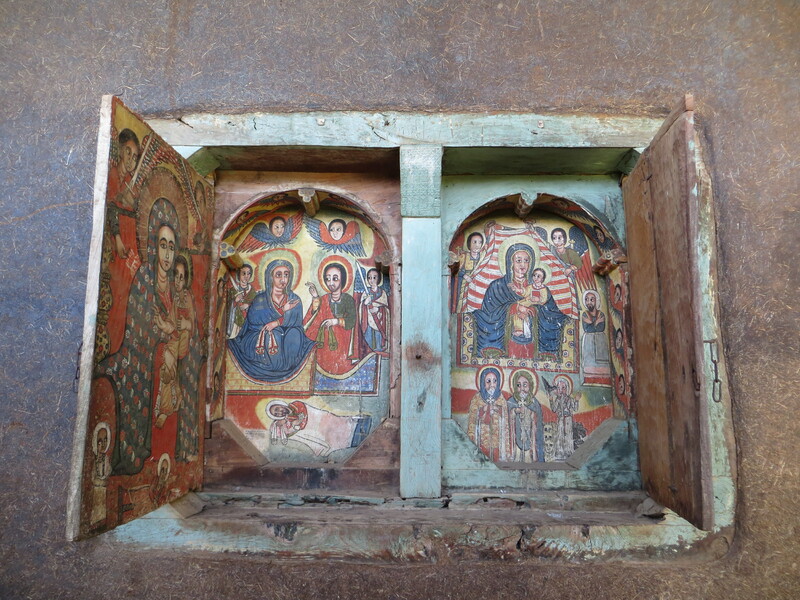 Paintings on the outside window of one of the lake monasteries – the monasteries date back to the 14th century, the paintings, the 17th. Note also the typical mud and straw construction of the walls. 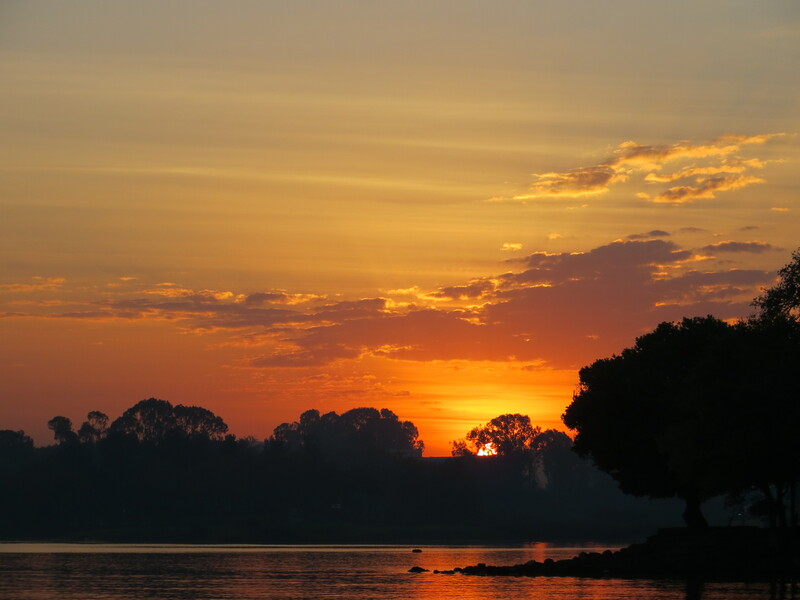 Early morning sunrise on Lake Tana. 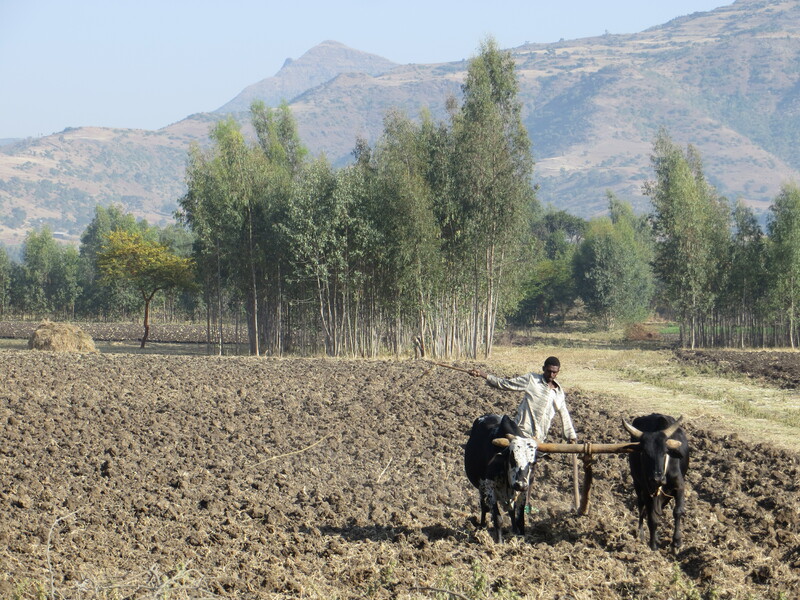 Farming the old fashioned way, on our way to see the Blue Nile Falls. 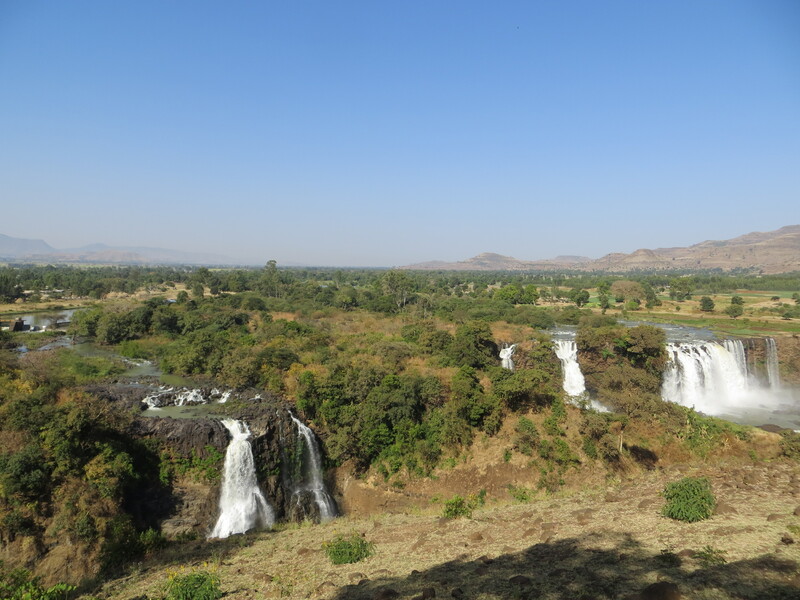 Blue Nile Falls, second biggest in Africa to Victoria Falls. Really beautiful…and we were really lucky. Normally at this time of year it is just a trickle – we were expecting more like the Blue Nasal Drip – but the dam was open. And a few more thoughts on our trip. Some of the things that struck me the most, I couldn’t or didn’t even capture in pictures. C is a better “nonchalant photographer” than I am and has some great shots, but that’s the only way to capture some of these moments because otherwise you feel very intrusive, or like you’re the Great American Supergawker. Which maybe you are, but in my mind there was a line of respect you didn’t want to cross. One was the warmth of the people. I felt like everyone was always smiling and laughing, they greet each other warmly by pressing their heads and cheeks together two or three times (changing sides), and even as teens and young adults – and boys – walk down the street literally hand in hand, and they are so, so, so very responsive and grateful when you make as small an attempt as to say “hello” or “thank you” in their native language of Amharic. I never saw one fussy child (and we saw a LOT of children). You might look at them and think they have very little, but maybe the thing is that we all have so much? The other is that you’ll never see harder workers. Some people still have to walk 5 or 6 kilometers for water, and the women do it and carry 40+ pounds of it all the way home, often in bare feet. One of the clearest visions I have in my head is of a mother walking up a big hill, water container on her back, her hands underneath it, and by her side, a little girl who was maybe 3, carrying a little baby sized one. She will carry water her whole life and will never know anything different. And who is handling the cattle during the day, bringing them out and back in, and watching over them all the while? 6 year old boys. What a huge responsibility. I am still struggling for the best one-word response when someone asks me how my trip was. A word that infers it was more of a ten-day experience than it was a vacation, that it was travel with the intent to learn and to have my eyes opened, a trip that will leave me more things to think about than I have pictures of. Amazing? Incredible? Maybe the best bet is unforgettable. 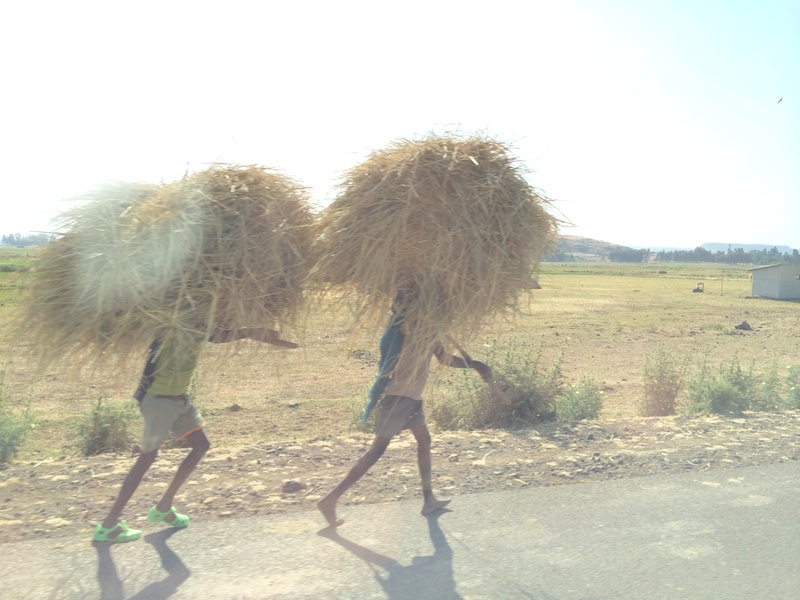 This entry was posted in Uncategorized and tagged Bahir Dar, Ethiopia, Gonder, travel. Bookmark the permalink.